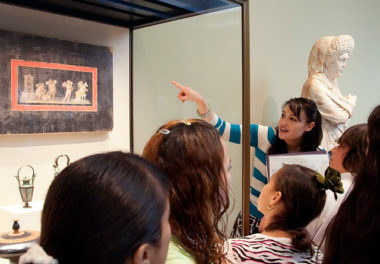 The Agrigento Youth, a Greek sculpture carved almost exactly 2,500 years ago, is wintering at the Getty Villa. It’s the second work from the Museo Archeologico Regionale in Agrigento, Sicily, to visit the Villa on loan, following the Gela Krater, last summer’s visitor. Both come to the Museum through the Getty’s long-term collaboration with the Sicilian Ministry of Culture and Sicilian Identity. 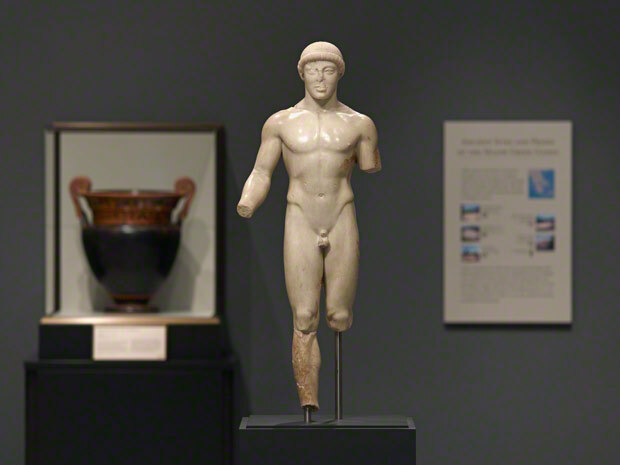 This Sicilian kouros, or young man, is installed in Athletes and Competition (Gallery 211), where he joins the larger Getty kouros, the sculpture that may date to 530 B.C.—or may be a modern forgery. 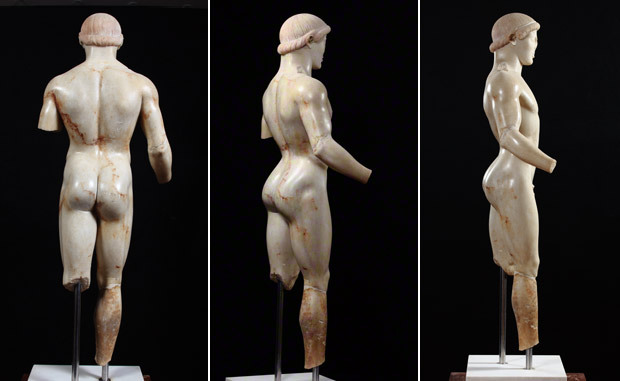 Kouroi, statues of young men, depicted the ideal male form, and were used both as grave markers and as religious dedications at sites and sanctuaries across the Mediterranean. The fineness of the sculpture is a reflection of how wealthy Agrigento (once known as Akragas) was in antiquity, as many Greek colonies in Sicily were. One of its citizens could afford to pay for the importation from Greece of the marble used to create it, and for the fee of the unknown sculptor who carved it. It’s unclear who the Youth is intended to represent. Is he the river god Akragas, as some have concluded by comparing him to personifications found on ancient coins from Agrigento? “It’s possible, but river gods are usually older, bearded men,” said Karol Wight, senior curator of antiquities. Was he an offering to Demeter, whose sacred spring ran near the spot where he was unearthed in the 1800s? Perhaps, but he might have once stood far from where he eventually lay. “He could have been a spoil of war that someone dropped along the way,” Mary noted. In the gallery, the Agrigento Youth presents a dramatic contrast with the Getty kouros in style, pose, size, and surface. The first thing that strikes you is the finish—the Getty kouros is rougher and slightly yellow, while the Agrigento Youth is ivory and polished to a dramatic sheen. Marbles age in different ways. “Many antiquities were buried for centuries, and a lot depends on what was going on in the soil around them,” Karol said. Mary points to the Youth’s right calf, which was found in a different spot from the rest of the figure and thus weathered differently, taking on more staining from iron in the soil. Below their surface differences, the Getty kouros and the Agrigento Youth diverge dramatically in style. The kouros showcases key elements of the Archaic style, with his rigid pose, stylized features, and serene smile. The Youth sports stylized hair and facial features, but his torso, knees, and ears are remarkably naturalistic, an intriguing combination that today is known as the “severe style.” In fact, he was sculpted at the exact moment when Greek art was changing from Archaic to Classical, formal to naturalistic. 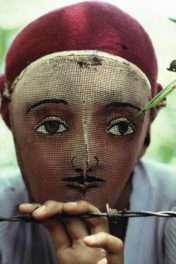 “The face retains that archaic look much longer than any other part of the body,” explained Karol. And this subtle movement contributes to what is perhaps its most notable quality of all, at least to the non-expert: its beauty. The mystery behind this piece is the most intriguing part of this story. It leaves so many possibilities. Sicilian pieces are of great interest to me as one side of my family originated from the area. It is such a history-rich part of the World. 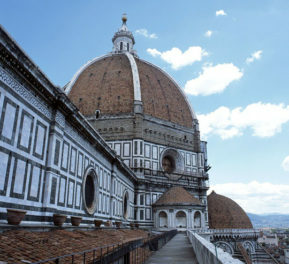 I hope to visit one day soon!